Evernote has a really powerful search language, but like SQL, its power comes with a somewhat steep learning curve. The truth is, most users never bother to master it, which is a pity. The nice folks at Evernote are well aware of this limitation and have been hard at work developing better ways to hide or simplify the complexity. They’ve christened their new baby descriptive search. This feature works by allowing you to describe what you’re looking for by using common terms, which makes creating a complex search incredibly straightforward. At the time of this writing, descriptive search is available only for the Mac and in English. Evernote promises that this feature will be making its way to other languages and versions of Evernote soon. When descriptive search is available, clicking the search box brings up a helpful window to guide your search (see the figure). The first section shows your last five searches, and the next section lists your saved searches. You can also narrow the search results by choosing different criteria. Click Show Less to hide most of them. The previous figure shows the additional options visible when the Add Search option is clicked. Another window opens, allowing you to further constrain the search. 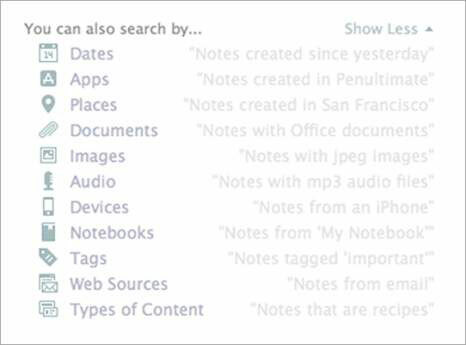 The following figure shows a descriptive search for notes that contain audio files. 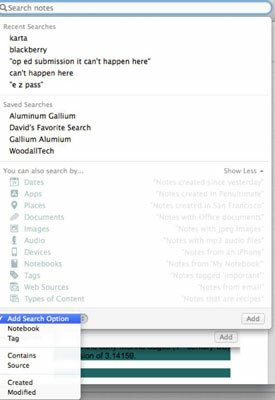 If you don’t select a different option in this window, Evernote searches your entire account, which is the default setting. “Images from Rome since 2012”: This search brings up all your notes since 2012 that contain images with Rome as the location. “Recipes with photos tagged vegetarian”: This search shows any notes that Evernote classifies as a recipe that contain an image and have the tag vegetarian. The following figure shows other ways to constrain a descriptive search to find just what you want. These options are on the drop-down menu you see when you click the search box.